It's Food Week on PC Gamer, and we're looking at all the interesting ways games and grub intersect. It's food week on PC Gamer, which means we're all writing about food and making ourselves hungry. We have questioned the veracity of the Tacopocalypse tacopocalypse and debated the finest gaming snacks. Today we're going to get practical. Well, more practical. Have you ever raided a bin in Dishonored and thought 'hmmm, I could really murder a delicious Gristol Apple?' Wouldn't it enhance the Dishonored experience to have a side of jellied eels on the go as you sneak through Dunwall? Let's find some food that captures the themes of our favourite games, and admire some of the cool food that fans have made to celebrate their favourite games. Food: It seems wise to accompany the royal soap opera of Crusader Kings 2 with tastes of a royal court in the middle ages. To replicate the life of a middling official at a William the Conquerer banquet, consider heaps of cooked venison in a trencher—a square-cut hunk of bread that served as a plate. The meat juices soak down into the bread, which you would then supposedly give to peasants to show your virtue. If you’re sitting on your own at your PC you can just scoff it instead; the peasants will never know. For more, the BBC has a fun summary of courtly food traditions. Drink: Wine from the European continent, if you’re feeling fancy and want to emulate royal tastes of the era. For something really special have a cup of water purified with a ‘unicorn horn’. These gifts, often fossils or narwhal horns, were lauded by royalty in the middle ages for their medicinal properties. Food: A chicken dinner, obviously. An ordinary roast will do the job, but why settle for meat and two veg when you can consume the most entertaining thing a chef has done with chicken insides in recent history? Heston Blumenthal’s chicken liver meat fruit is a painstakingly crafted soft parfait dunked in mandarin jelly. It takes a few days to make, but it has the advantage of being small enough to fit in one paw so you can smash it right into your open face when you win. Drink: A mug of Chicken Bovril. If you’re unfamiliar Bovril is a highly suspect British hot drink that’s essentially a hot stock that contains ‘meat extracts’. It’s sometimes used as a spread on toast but if you want to go full chicken you can brew a mug of the chicken variety alongside your winning dinner. 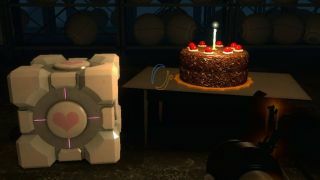 Food: Everyone knows the meme, but how do you make the famous cake in Portal’s outro? The officially licensed Portal cake mix seems to be currently unavailable, but it’s basically a chocolate cake with some cherries on top isn’t it? Geeky Chef has you covered. Drink: Defy J K Simmons and make a refreshing glass of lemonade. There are thousands of takes on this simple drink, and in this situation I always tend to fall back on Felicity Cloake’s excellent ‘how to cook the perfect…’ series to cut through the noise. Food: Astronaut Ice Cream would seem to be a good place to start, except it's not real, and it's horrible. For the true outer space experience we need to go to NASA directly. A few years ago a national school competition in the US sent a new astronaut meal into space. You can find the recipe for that meal—Jamaican rice and beans with coconut milk—on the NASA website. For the true experience you need to freeze-dry the food, insert it into some specialist packaging, and then go to space and thaw it out. The same goes for NASA's cornbread dressing recipe. Drink: Astronauts drink pretty ordinary drinks, but let's pick an espresso made with a painstakingly engineered NASA espresso machine and enjoy a video of Chris Hadfield's space kitchen. Mmmm, peanut butter honey tortillas. Food: Recharge your cybernetics with a homemade energy bar. Note that you may have to carry entire boxes of these in your trench coat if you want to use your abilities more than once or twice per mission. Drink: In Deus Ex Gunther complains that the maintenance staff have swapped out orange soda for lemon-lime in his favourite vending machine, because everything in Deus Ex is a conspiracy. Become the maintenance man and emulate their treachery with a refreshing lemon-lime drink of your own. Food: Celebrate The International with some themed party snacks. It's All Geek To Me has created awesome viewing party spreads for The International 5, 6, and 7. Highlights include a cupcake recreation of the map (complete with stealthy Monkey King). Drink is covered here too, with salve lemonade and boozier drinks tinted with blue curacao to create clarity potions. Food: In case you missed it, over the course of 15 months Rebekah Valentine tried all 100 recipes in the World of Warcraft cookbook. Any one of those will give you a curious taste of Azeroth. Wes spoke to the cookbook's author Chelsea Monroe-Cassel about the process of translating WoW's 1100 consumables into workable recipes that we can make in our real-world kitchens. Food: Dunwall is heavily influenced by old London, which is why you find jellied eels all over the place. This used to be a popular cockney snack, but while their appeal has dwindled you can still find producers today hauling eels out of the Thames and turning them into gooey snack pots. Given that even in Karnaca in Dishonored 2 seafood still seems to be hugely popular, you can emulate the Dishonored experience with unusual seafood of your choosing. How about some Icelandic fermented shark? Traditionally the shark is buried in some dirt for 6-12 weeks before being dug up, cubed up, and sold to visitors who don't know what they are getting themselves into. As one of those visitors, I can confirm it tastes like soap gone wrong. Drink: With the exception of Padilla Pear Soda all the drink in Dishonored is simple boozy fare. Though not at all recommended you can probably emulate the taste of the grimy Dishonored universe by acquiring some nameless cloudy liquid from a bag you find at a cider festival, or by leaving a Guinness out in the sun*.